of the sky looked mostly clear which I took as a good sign! Sept 15 (Part 1): This was such a busy and crazy day, I'm breaking it up into two posts! The day started particularly early for Karolina. We didn't really have an alarm clock to make sure she'd wake early enough to get to the train station in Fort William on time, but I assured her that I normally woke early enough and could be her alarm clock. I did wake up, at 5:40 in the morning, and whispered over to Karolina. "Hey, Karolina! It's 5:40 now!" She whispered back that she was already awake and had been for nearly a half hour. She took 20 minutes packing up her gear--except for the emergency blanket. Since she was getting off the trail today, she didn't need it anymore and since I had no groundsheet, I asked if I could start using her emergency blanket as a groundsheet instead of the tarp I had been using. She hiked off, down the trail, and I settled back into my sleeping bag for another hour or so. I didn't hike with Karolina today for two reasons. One, I needed more light for photos and 6:00 was still much too early to get good photos. 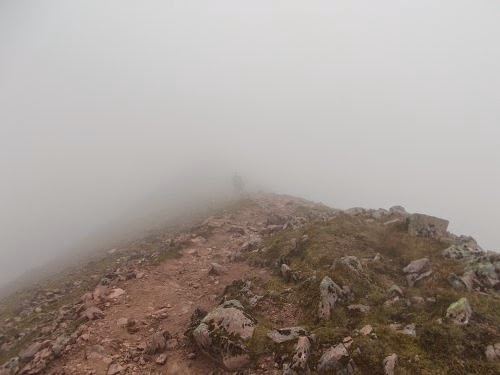 And two, I wasn't going in the direction she was headed--I planned to veer off of the West Highland Way to summit Ben Nevis: the highest point in Britain. Towering 4,406 ft (1,344m) above sea level, it doesn't sound like much, but it's the Mount Washington of peaks in the British Isles. I went back to sleep for another hour or so, then ate breakfast and broke down camp. 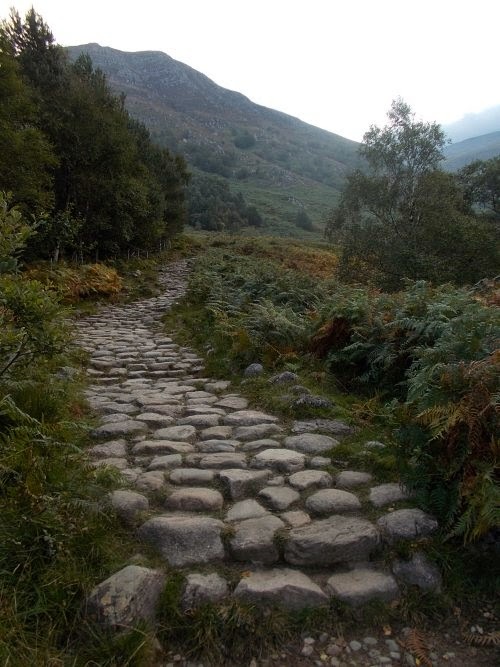 I followed the road for maybe 15 minutes to Glen Nevis and the trailhead for Ben Nevis. Being the highest point in Britain, I had read that this trail was immensely popular and crowded, but this early in the morning, I didn't see anyone. A nearby restaurant hadn't even opened for breakfast yet. Not a bunch of early risers in this part of the world! What the heck are achintees?! Reading about Ben Nevis reminded me a lot of Mount Washington--the similarities abound. A weather observatory was built in 1883 and a substantial path was built to service it. Although the weather observatory on Mount Washington is still active, the one on Ben Nevis was abandoned in 1904. A summit hotel and pony rides to the top were also abandoned soon after the ideas were conceived. Like Mount Washington, though, this mountain was a "fearsome reputation for accidents" (as my guidebook describes it). 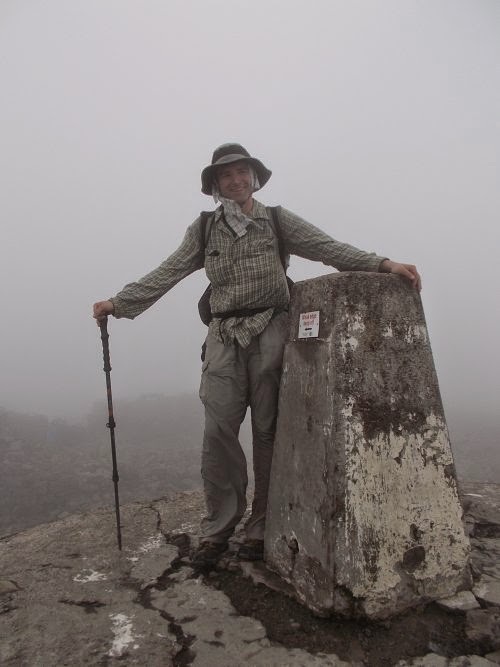 The summit is in clouds an average of 300 days per year. Patches of snow can be found in the crags year-round. The trail climbed steeply and persistently, and despite the cool morning, I was quickly sweating bullets. The trail, however, wasn't bad. It was wide, well-constructed, and mostly even and although it was one of the steepest sections of trail I had yet to see in Scotland, it could have been much worse. The trail curved around the contours of the mountain gradually instead of straight up the side so I covered ground quickly. 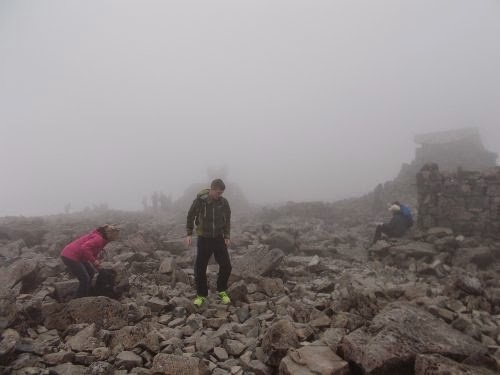 The very tippy-top of Ben Nevis was in the clouds. I hoped those clouds would burn off before I reached the top--the rest of the sky was largely clear which fueled my hope--but the weather report posted to a sign at the trailhead suggested the weather would be the same as the day before. However, the day before it was never clear. This morning, it was already mostly clear. I crossed my fingers and pushed onward and upwards. Left a route plan with someone: Nope. Checked the weather: Best I can tell, mostly clear with clouds at the top. I passed a grand total of two people, an older couple, on my way up the trail. Further up the trail, I could see two more people, but I never caught up with them. Those four people were the only ones I saw on my way up. 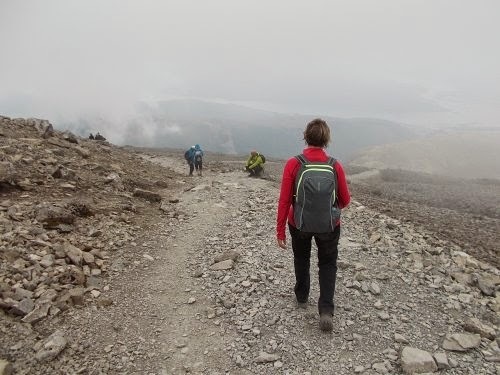 After climbing nearly 2,000 feet up, the trail reached a pass where it splits. 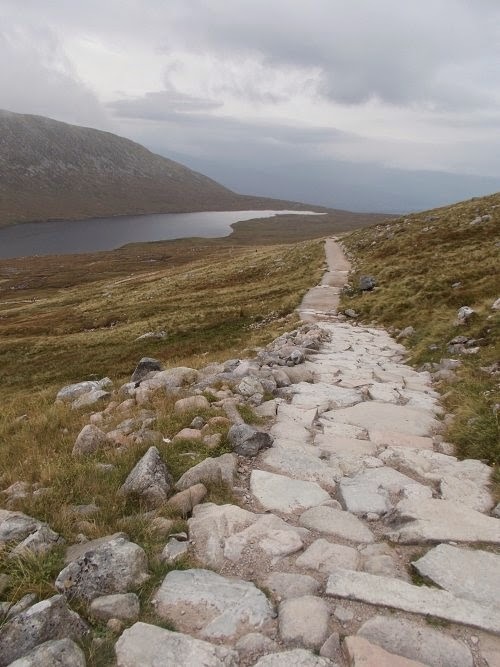 To the right was the Tourist Route, the main route to the top of Ben Nevis that almost everyone walks. 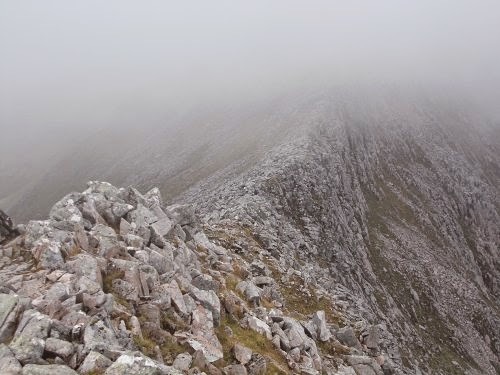 However, my guidebook described the Carn Mor Dearg (CMD) Arete Route which it described as "a superb route that provides a tough, long, but grand day out, befitting of Britain's highest mountain." 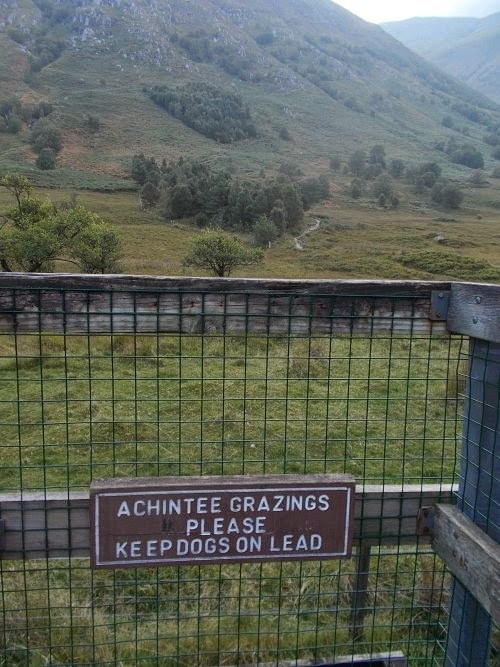 Sounded like a nice trail to take! And I could follow the Tourist Route back down. 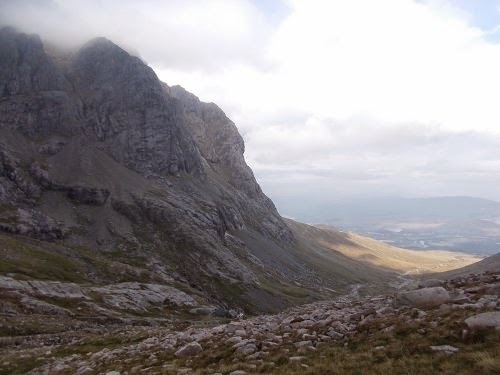 It describes the CMD route as being considerably more difficult than the Tourist Route with additional descriptive sentences such as "It is a long route, requiring stamina with some sections of easy scrambling." By my standards, that doesn't seem bad at all. Easy scrambling? Yeah, no problem. 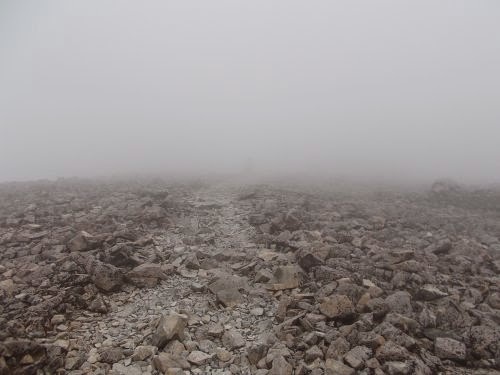 It goes on: "The main difficulties on Ben Nevis occur on the summit plateau in poor visibility. 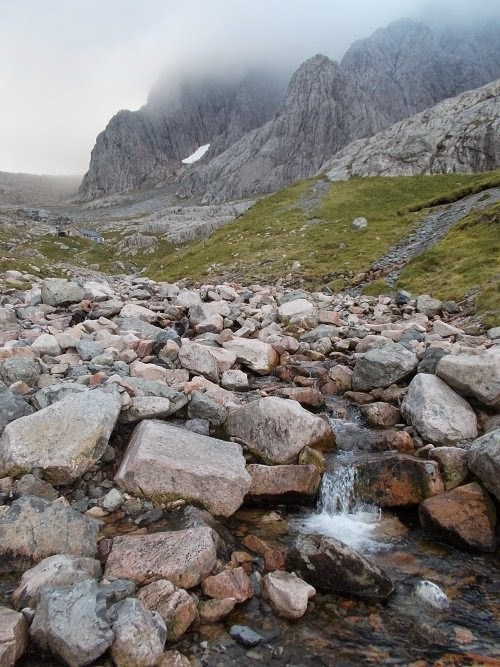 The plateau is broad, relatively featureless and fringed to the north by a wall of crags which drop precipitously into Coire Leis below. 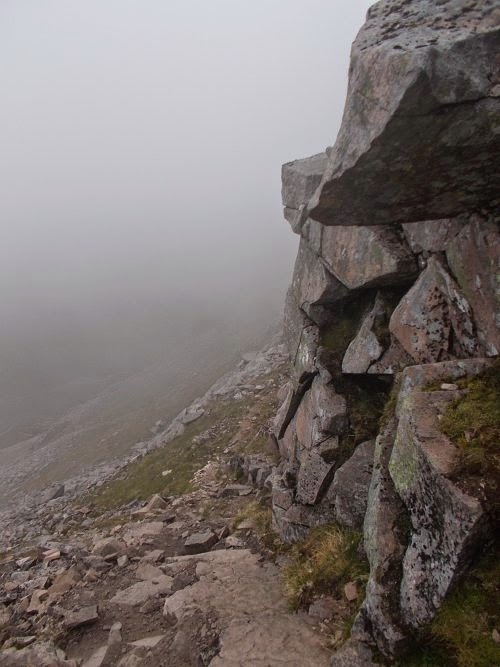 The gullies that cut into this rock wall have too frequently ensnared lost walkers and climbers wandering round the plateau in white-out conditions. 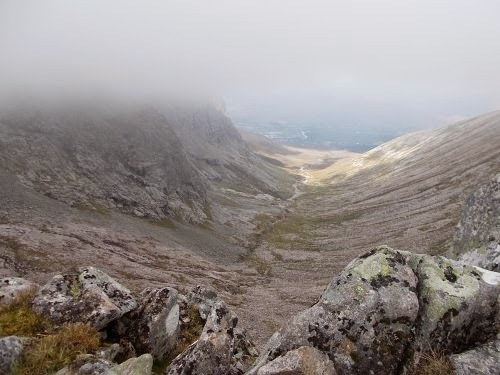 The other real danger is that in an effort to avoid these gullies the walker aims too far south, missing the descent path and straying onto the dangerous ground at the top of the notorious Five Finger Gully on the west side of the plateau." 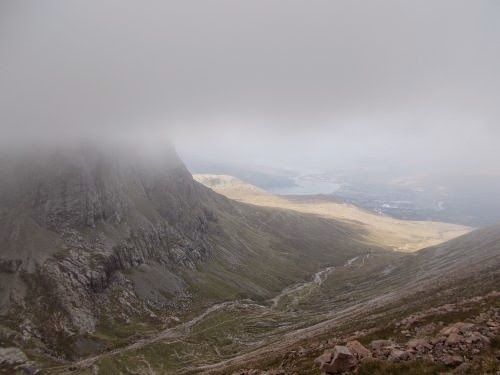 I could see the clouds at the top of Ben Nevis. 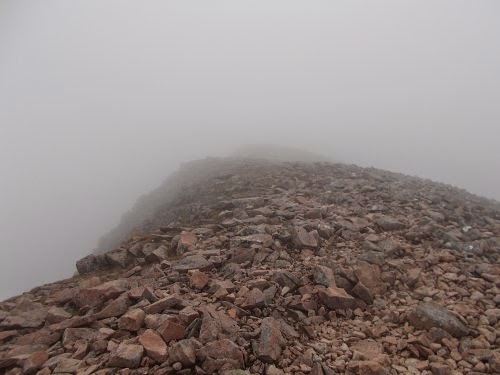 If they didn't burn off before I reached the summit, poor visibility would be a very real risk. I'm glad to hear that Five Finger Gully still has all five fingers, but it sounded like if you got very far off trail, things could get bad. I examined the map in my guidebook--a hand-drawn sketch of the area. The whole guidebook used hand-drawn sketches with far more detail than you'd find in any topo map and has been wonderful, and I had little reason to expect less from this map. 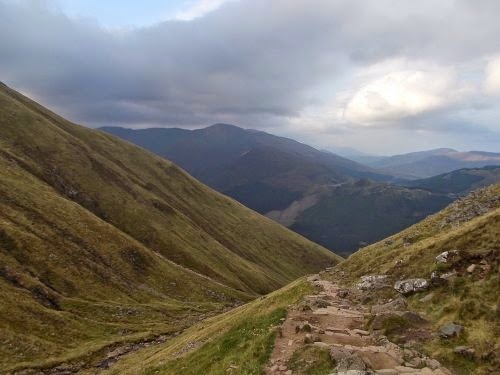 The trail splits, loops around the Ben Nevis's summit to the north, climbs to the top of a ridge, then looks like it follows an old road to the summit. There are observatory ruins and a "basic shelter" which I figured the road must have led to back in the day. It was probably closed to traffic now. One point on the CMD route had an unusual note: "Cut across stream here (not an actual path)." The map showed a trail to a CIC hut, then veers off 90 degrees across a stream up a steep hill to a ridge, and a second smaller trail that cuts across the stream just before the CIC hut. I was a little puzzled by this part of the map. Why couldn't we follow the trail to the CIC hut then over the creek? Why cut across the creek where there isn't a trail? As is often the case with maps, I figured it would make more sense when I saw the ground conditions myself. So that's what I was walking into. It sounded like the trail might be a little more rough and definitely longer because it looped completely around the summit, but I bet it would have far fewer people (not that the Tourist Route had many at this time of morning), better scenery, and I hoped if this route took an extra hour to walk, maybe it would give the clouds at the top of Ben Nevis more time to burn off. Looking back down the mountain. What happened to all those blue skies I was admiring earlier? 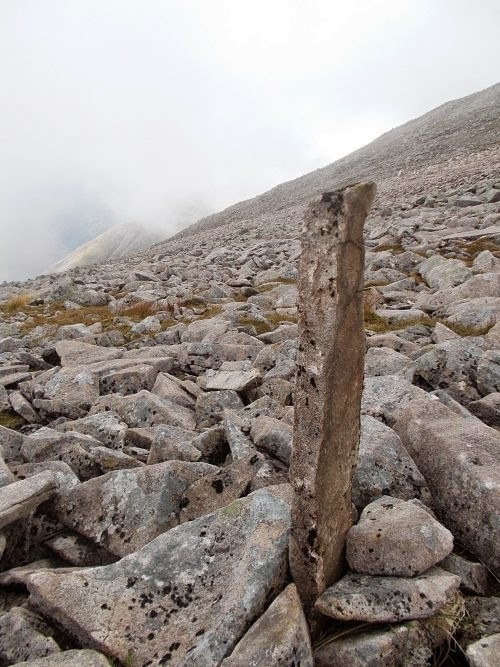 So I headed left around the north side of Ben Nevis. It wasn't long before the well-maintained trail turned into a mud bog. Bleah. I'm happy to report, however, that only lasted about 5 minutes before coming back out onto a small, little-used trail--but at least it was on solid ground again. The trail stayed more-or-less flat for a mile or two and I was making good time. The views of the north-facing crags of Ben Nevis were spectacular. 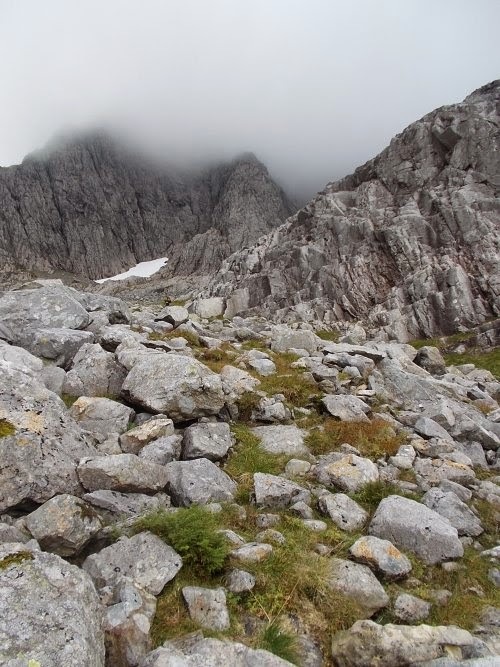 Then the trail curved around looping around to the east side of Ben Nevis and I started having more trouble following the trail because it was getting lost among all of the rocks. In the distance, I saw a couple of hikers walking up a road from another direction. So I'm not the only person taking this route! I thought. But clearly, they had found another trailhead to start from. 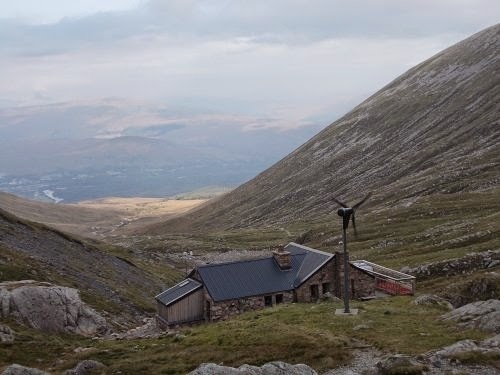 Eventually I reached the CIC hut, a small building with a wind turbine for power spinning in a blur. It looked like a shelter, and I tried one of the doors, but it was locked. That was okay, though, I didn't really need to get in it anyhow. 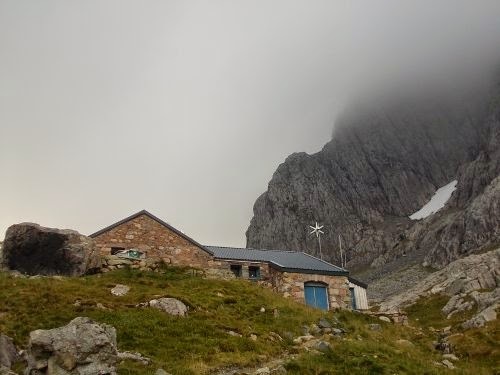 Several minutes before I arrived, I saw another hiker leaving up behind the hut and wanted to catch up with him. A barely discernible trail led up behind the CIC hut, and I followed it in the direction of the other hiker. I'd lose the barely visible trail occasionally, then pick up again a few minutes later. It was generally heading up the valley, but seemed like it was getting closer and closer to craggy cliff towers now to the west and I couldn't imagine a trail getting to the top through all of that. I wanted to stop, rest and take another look at my map, but I was gaining on the other hiker and didn't stop. Even though the hiker had only several minutes of a head start, it took me nearly 20 minutes to catch up with him. When I did catch up with the guy, I asked him if he knew where he was going because I didn't. Not really. I kind of knew where I was, but I wasn't confident at all about where I was going. 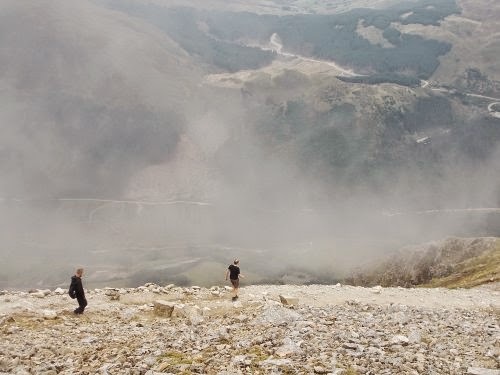 He asked where I was going, and I told him I was headed for the top of Ben Nevis, and he asked if I had any climbing gear (because it certainly didn't look like I did). 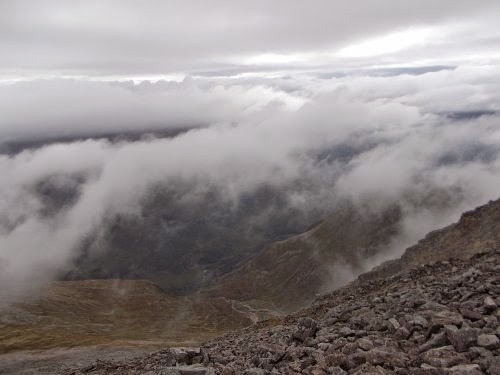 Clouds continue to roll around the upper reaches of Ben Nevis. No.... But then, I didn't see any climbing gear on him either. He shook his head and said he was exploring the craggy cliffs of Ben Nevis and that there wasn't a route to the top from where we were. Crap! "So how do you get to the top?" I asked. He seemed to think I was completely and utterly lost, like I should have been on the Tourist Route and somehow found myself on the complete opposite side of the mountain, so I explained I was trying to get up the "back way." The hiker didn't know anything about a back way, though. I sat down and pulled out my guidebook, comparing it with the features as I could now see from the ground. There was a definitely 90 degree turn in the trail at the CIC hut, and I had largely gone straight following the path of least resistance. In fact, it looked like the trail was supposed to head due west--the complete opposite direction of the summit--and straight up an impossibly steep-looking ridge. My heart fluttered when I realized where the map was trying to guide me. Surely that can't be right! I thought to myself. I rummaged through deeper into my pack and pulled out the big gun: a topo map. A highly detailed topo map. The little hand-drawn maps in my guidebook had been doing me well all of the way from Glasgow, but if this guidebook was directing me where I thought it was, I wanted a second opinion. Lochan Meall an t-Suidhe is in the distance. Does the name 'Suidhe' look a little too much like 'suicide' to you? It kind of looks like suicide to me... I hope that's not a sign! I opened the topo map--a giant kite-sized piece of paper that you had to be careful not to let blow away--and found my location on it. There was a trail, leading around from the Tourist Route around the north side of the mountain to the CIC hut, then the trail... stopped. A complete dead end. No trail at all after that, in any direction. 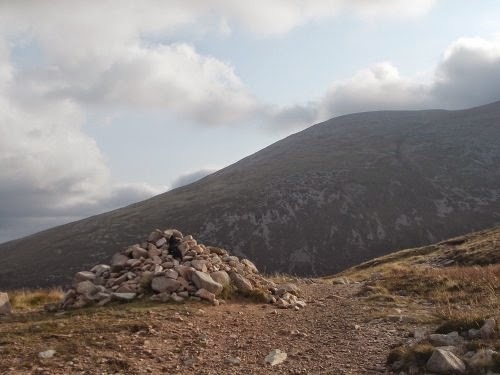 What I thought was an old road to the top of Ben Nevis in my guidebook was actually the ridgeline of the ridge--quite obvious once I looked at my topo map. To the east was a steep ridge, and I could see the ridgeline looping around to the south and west, but the road I thought was there... nothing. Not even a trail showed on my topo map. Based on my topo map, there was absolutely nothing to mark the route between my current location and the top of Ben Nevis. That little note in the guidebook about "not an actual path"--of so little importance that it was put in parenthesis--suddenly took on a whole new meaning. I thought it was just across the creek there wasn't a path, but there was no path for miles! No trail at all! That might not seem like a big distinction to you--no "path" and no "trail," but to me they mean very different things. A path is a line in the ground that you can follow because it's right there on the ground. It's generally clear of obstacles and doesn't even need to be marked except when two paths intersect and there might be some confusion of which direction to follow. A trail, however, doesn't necessarily mean there's a path. 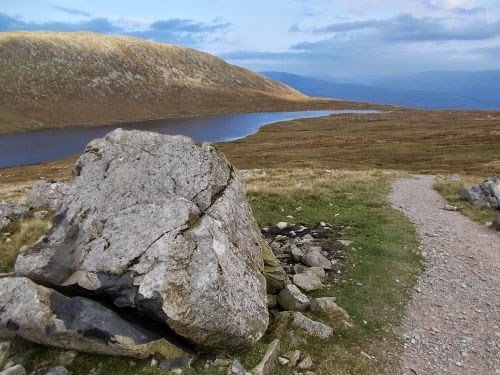 It could be a route marked with cairns. There were parts of the Arizona Trail that was an actual trail, but there was no path in the ground delineating it. So in my book, the lack of a path didn't necessarily mean there wasn't a trail; when I saw that there wasn't a "path," I figured the route must have been marked with cairns or something. But no, that wasn't the case at all. This route was completely cross-country. 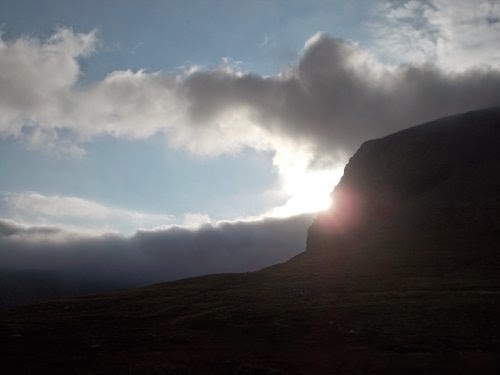 The sunrise peeks out from behind the north crags of Ben Nevis. And now I had a big decision to make: Turn around or keep going? I'm generally comfortable traveling cross-country, but I had a couple of things giving me pause. First, if I injured myself and couldn't get out on my own, there was absolutely nobody who would be looking for me anytime soon or report my disappearance. And since I wasn't on an established trail, it would be unlikely anyone would simply come across me. Nor did I have a cell phone or anything to call or signal for help if I did get hurt. A relatively minor injury along this stretch could turn into a life-and-death situation. That was my first concern. 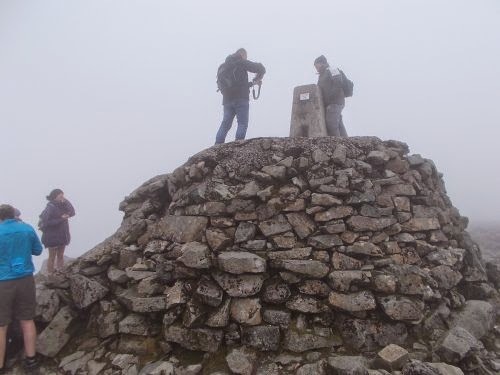 The second concern was that the top of Ben Nevis was still in the clouds. All of the ridges at the top were in the clouds. Navigating cross country with nothing more than a map and compass with limited visibility could be difficult. And this was a mountain I had never seen before in my life until today. It's not like I knew this mountain or its terrain very well. It's easy to look at the glass as being half empty, but I did have a couple of positive point to consider as well. For instance, I had a full backpacking setup on my back. 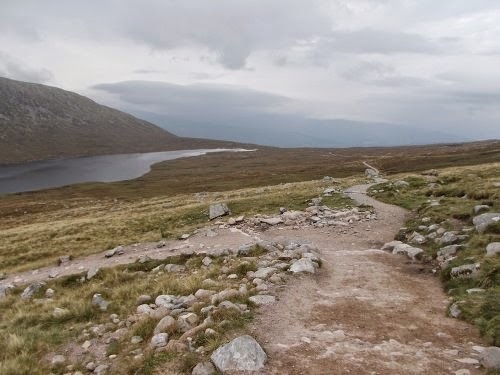 Although the hike up Ben Nevis was supposed to be a day hike, since I had backpacked the West Highland Way, I had all of my backpacking gear with me. I could hunker down for a long time waiting for rescue should I need it--assuming whatever injury I faced didn't kill me quickly. And.... I have done stuff like this before. I have traveled cross-country, away from trails. 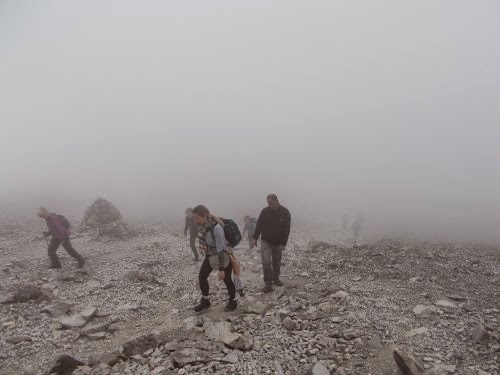 And although the visibility was poor at the higher elevations, it seemed like it would be pretty difficult to get lost. Basically, I just needed to head uphill until I reached the top of the ridge. 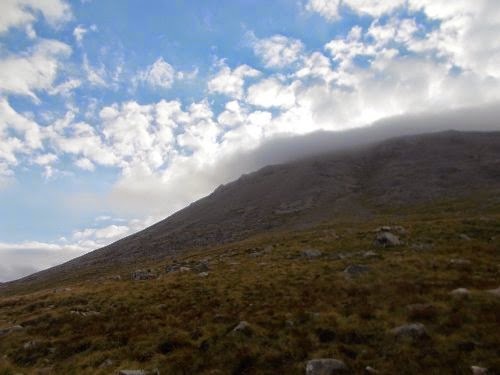 Once I reached the top of the ridge, I should follow it south then west until I reached the top of Ben Nevis. Easy, peasy! 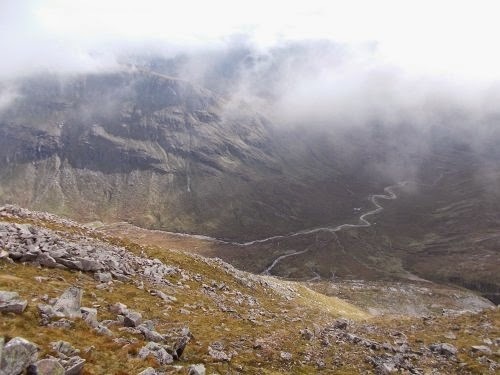 I decided to complete the loop around Ben Nevis. I backtracked a bit towards the CIC hut, then headed straight up the ridge to the east shortly be reaching it again. The ridge was steep--even by my standards I considered it steep! Progress was difficult. Some sections were so steep, I would slide down the grass when I took a step up. Then I tried stepping on rocks for more traction, but many were loose and would tumble down the mountain as I shuffled my feet to stay out of the avalanche I created. Eventually I settled on switchbacking back and forth between two gullies. The gullies themselves I avoided because it was difficult to get up and down their banks and the rocks in it were loose and sketchy to walk on, but the gullies headed straight up the mountain so as long as I stayed between two gullies, I was headed in the right direction: up. I stopped to rest and drink from my water bottle every 10 or 15 minutes. I couldn't stop very long, though. As I climbed in elevation, the wind became stronger and colder. I'd sweat bullets working my way up the steep hillside, but I'd feel a chill down my back within seconds of stopping to rest. Finally my elevation climbed up to the cloud level and my visibility dropped dramatically. I could no longer see the bottom of the valley with the CIC hut far down below. Above.... I couldn't see the top of the ridge either. Just an endless stretch of rocks fading out into fog. I took some pictures, and found them frustrating. I really wanted to capture the steepness of the slope, but everything in my photos looked completely, utterly flat. The ground surface really was quite flat--just tilted steeply which photographs couldn't really capture. 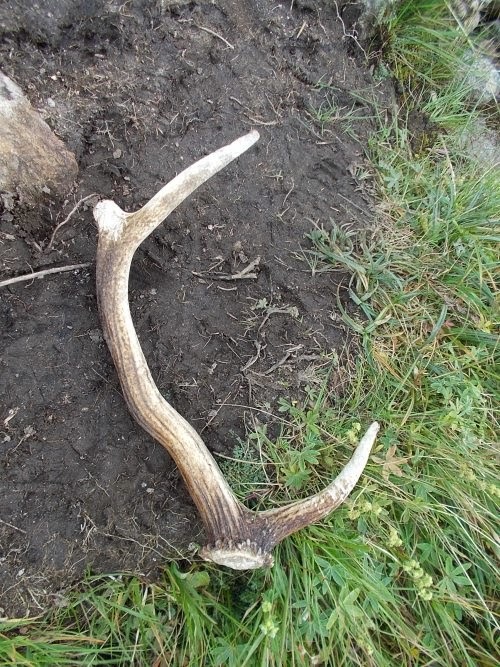 In all the years I've been hiking and backpacking, I've never found an actual antler on the trail... until today! The lack of visibility really bothered me, though. In theory, I knew I was still headed the correct direction, but it's annoying and disorienting to not seeing where you are in relation to the rest of the world. I started wondering if I had made the right decision heading in this direction. Now if I injured myself, and if someone reported me missing, they wouldn't even be able to see me through all of this fog. At least under the clouds a helicopter could have spotted me easily. In the thick fog--not a chance. But I continued marching upwards. The slope seemed to bend away from me, becoming less steep, and I hoped this meant I was getting near the top of the ridge. Several minutes later, I reached a definite high point--the ridge dropped as precariously on the other side as the side I climbed up. Yes! The long climb was over! I was exhausted, though. I stopped for a drink of water, then turned and followed the ridge southward. Somewhat surprisingly, I found a small trail along the ridge. The trail wasn't marked on my topo map, but I liked seeing it. It meant other people used it enough to pound it into the ground and it was now possible that a random person hiking along this ridge would find me if I injured myself. Not that lots of people were up here, but it seemed more likely to happen than the slope I had just climbed up. Despite the trail, however, the hiking didn't progress much faster. It was definitely an unofficial, unmaintained trail and required a lot of rock hopping along parts. About ten minutes after following this ridge, I caught up with two other hikers also following the ridge and my spirits soared. My fears about what to do if I had a serious injury vanished. There was help around now. I asked where they were headed--if they were going all of the way to Ben Nevis, they'd be following the same route I was. 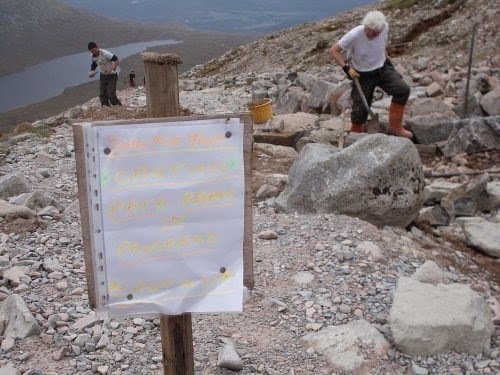 And they were headed to Ben Nevis's summit. Excellent! I skipped ahead of them, happy to know that there were now two hikers not far behind me. The trail is becoming more difficult to follow the further away from the Tourist Route I get. Some time later, I passed another group of hikers--three of them with their dog. More people! This ridgetop wasn't as remote as I thought, and I was quite thankful for the fact. I'm not sure where they all came from, but I'm pretty sure it wasn't the trailhead where I started at on the east side of Ben Nevis. My progress was slow enough that I wondered if I'd finish before the day was over. 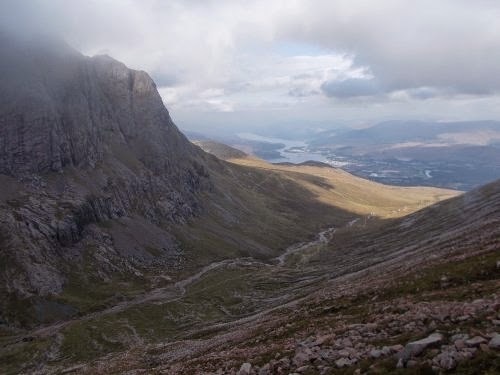 I had planned to hike through and past Fort William before stopping to camp somewhere on the other side of town, but at my pace, it seemed like there was a very real possibility I'd have to camp up here for tonight! The ridgeline curved around slowly and dropped what seemed like a few hundred feet in elevation, when suddenly a gust of wind blew the fog away and left an unexpected view of the valley below. 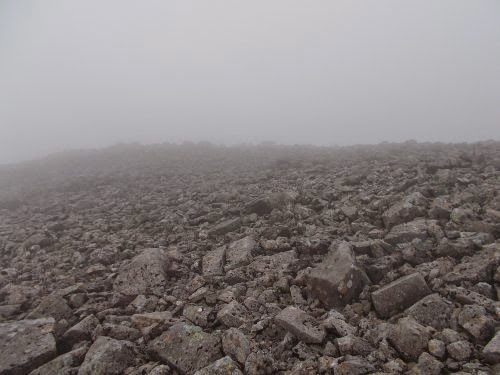 The top of Ben Nevis was still in the clouds, but the ridge had dropped just enough to squeeze under the cloud layer for a view. A very brief view. The view was awesome, but more importantly, I felt my place in the world again. I looked up the valley where the CIC hut stood far in the distance and realized I had looped further around and to the west than I thought I had. I was at least a mile past the point where I thought I was. Maybe I wouldn't be spending the night up here after all. But it was still late enough in the day now that I wondered if I would even reach Fort William. Maybe I'll wind up camping in the exact same spot I camped the night before? Wouldn't that be funny! Another pick-me-up was reaching a large cairn at a gap in the ridgeline. Civilization! A small trail snaked away to the west and I hoped it would lead right to the top of the mountain. It didn't, though, and the route soon plunged back into the clouds with its loss of visibility again. More craggy cliffs east of the highest peak. At least one person decided to set up camp here! 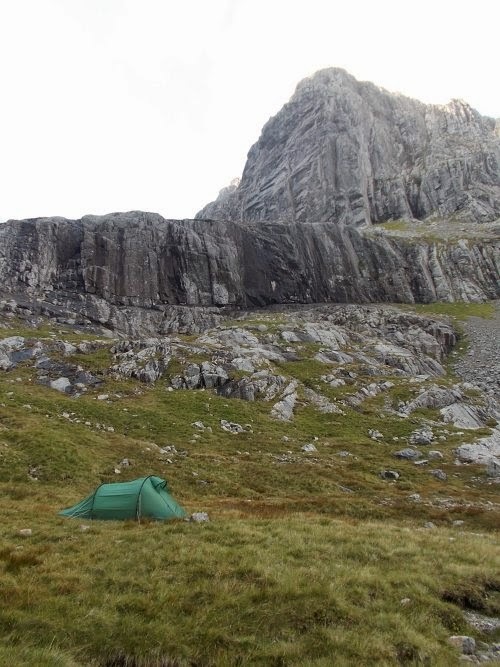 It was really cold and windy, though, and a fairly harsh place to camp. Even worse, though, I knew this section of mountain had a lot of craggy fingers and I couldn't just follow the ridgeline anymore. It was broken up by the crags and I needed to get up on the plateau at the top. I swooped around off the ridge but continued heading up. 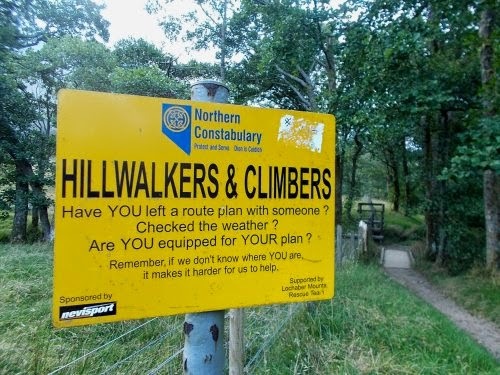 After all, when you're trying to reach the highest point in Britain, every step down was the wrong direction, and at this point, every step should be uphill. I just had to make sure I didn't accidentally walk off a cliff hundreds and fall hundreds of feet to my death. The terrain along this section turned into a giant pile of large boulders. I could no longer see the ground at all--just rocks on top of more rocks with dark holes designed to snag a leg and break it. I traveled as much with my hands and arms as I did with my feet, pulling myself up and over boulders. My progress slowed to a crawl and the wind screamed with fury. Occasionally I would find signs of humans. A long-rusted piece of sheet metal. A metal rod sticking out of the ground somewhere else. But for the most part, it looked like I was the very first person to ever travel along this stretch of ground. The steep slope once again mellowed, and I hoped it was a sign that I was nearing the plateau at the top, and that's exactly what happened. Yes! If you look closely at the green patch of grass near the left side of this photo, you can see the CIC hut. But it left me with a new problem... on a generally flat plateau in a thick fog, it's really hard to see which direction to go. Where was the very tippy-top of Britain? It could have been in any direction! One thing I knew had to happen, however, was that there were bound to be lots of people climbing up the Tourist Route. If that trail was as crowded as I had read about, I was bound to cross paths with them at some point. So I headed straight and within a few minutes I saw a tall cairn materialize out of the fog and saw two people standing next to it. "Yes!" I cried with glee. 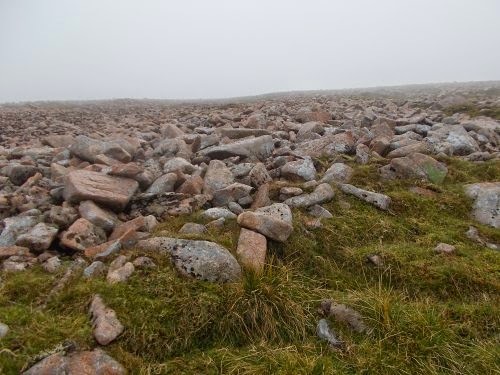 I rushed out to the cairn and could even see a light-colored trail leading past it: the Tourist Route. I had made it! "Yes!" I cried out again. I couldn't imagine what I must have looked like coming out from the fog--those two other hikers might have mistaken me as an apparition. It must have surprised them to see anyone materializing out of the fog from off the trail. The trail stretched out largely perpendicular from the direction I had come, and I assumed the eastward direction led to the very top of the mountain while the westward direction led back down the mountain. But how close was the top? "Am I at the top?!" 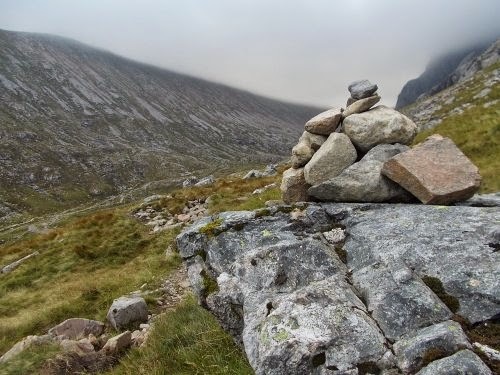 I asked the two hikers at the cairn, who seemed surprisingly quiet. "How close is the top?" I asked again, waving my hands around wildly. Here's a closer view as I approached the CIC hut. The two hikers looked a little scared of me, and one of them said in a broken voice, "No Eng-lish." Almost like it was three words rather than two. Then added, "Germany," while pointing to themselves. "You don't speak English?" I said, mostly rhetorically. "No English?" Of course not. That would have been too easy! But I wouldn't let that get my spirits down. I was thrilled to finally be back on an actual trail. 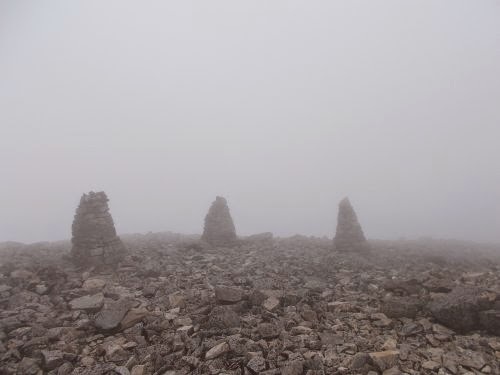 I followed the trail eastward, leaving the two hikers and the cairn fading off into the mist. It was only a couple of minutes before I found some other hikers on the trail, and still more. Less than five minutes later, I was surrounded by dozens of people. Mostly hidden behind small rock walls presumably built as windbreaks from the bitterly cold wind. I saw a few other huddled around a circular platform that I figured must mark the highest point in Britain, and at the top a couple of people were taking photos of each other. A couple near the base asked if I could get a photo of them together with their camera, which I did, then they did the same for me. I didn't linger at the top for very long, though. It was too cold and windy for comfort! And anyhow, I expected to be up and down the mountain by 3:00 in the afternoon and it was already getting close to 4:00. I was far behind my original schedule for the day! I headed back down the mountain and with a trail cleared of rocks and boulders, my pace picked up dramatically. It seemed like I passed a hundred people climbing up the mountain in the first 10 minutes. A hundred, people, in a zombie-like trance, slowly plodding up the mountain in obvious exhaustion. And here's looking back at the CIC hut after I passed by. At this point, I'm technically going the wrong way. I should have veered up the slope on the right side instead of following the valley upstream like I'm doing. "Turn around now!" I told them, "Before it's too late! It's just foggy--nothing to see at the top!" Some of them laughed. Some of them seemed to want to swat me like a bug in the way. One man who stopped to talk said he needed photos at the top, which I understood and I think he knew that, but was playing along. "Just take pictures of the fog here. That's all you'll see that top, and the fog here looks just like the fog at the top! Nobody will know the difference!" His eyes blinked wide with astonishment, and he took my right wrist in his left hand then put my right hand in his right hand for a handshake. "That's brilliant!" he told me. "That's a brilliant idea!" "Glad I could help!" We both had grins on our faces like we actually were at the top, but then I continued down the mountain and he continued on up it. I chatted with more hikers on my way down, heading both down and up the trail, and eventually the trail fell below the clouds and visibility opened up again giving me a view into my place in the world. At around this point, I started having serious concerns that I was headed the correct direction. I didn't think a trail could get through those crags up ahead! See the CIC hut far below? You can see the town of Fort William by the water in the distance. 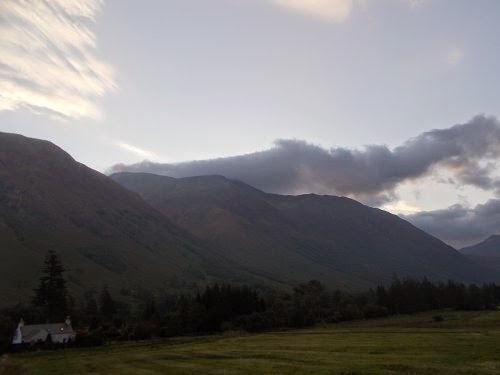 Fort William is the end of the West Highland Way and were Karolina headed off to so early in the morning. At this point, I'm starting to get into the clouds and losing my visibility. This photo is actually looking up a very steep hill, but because the terrain is so flat, it looks like it could have been taken on a plateau rather than a steep hillside! Reaching this point was a moment of glee since it meant I had reached the top of the ridge! Now I just had to follow the ridge line south then west. Along the ridge, I found this little used and unmarked trail. Which was a huge relief for me! The ridge line had some very steep cliffs on both sides of the ridge! The ridge dropped just enough and a lucky wind gust blew the clouds just right giving me this brief view in the valley below--just enough to realize that I was further into my hike than I had estimated. The valley is the one I hiked up. The crags on the left were the ones that blocked my way before I changed directions and headed up the slope on the right. It's a long way down the other side of the ridge too! The final climb to the top was the most brutal section of all where boulders hide all of the ground below it. It was rock hopping the rest of the way to the top! The Tourist Route! We're back on a real trail again! Zombie hoards of exhausted hikers materializing out of the fog work their way up to the summit. I'm finally starting to get below the clouds and out of the fog. "Suicide lake" is ahead! That's where I split off from the Tourist Route to go around the north side of Ben Nevis. I've almost completed the circuit around the mountain! Here's the actual junction where I split off from the Tourist Route so many hours before.... This time, I'll turn left down the mountain back the way I came. I was waiting to read about that day! Wow! It really was difficult! Still, I kind of wish I had been there with you... not alone, though, too dangerous! Great photos, btw =).